PresentationTube offers a video presentation recorder and network to help teachers, students, virtual presenters, and business professionals record, upload and share quality and interactive video presentations. The recorder helps presenters clearly identify the main points of a topic or activity while still providing the details through presentation. 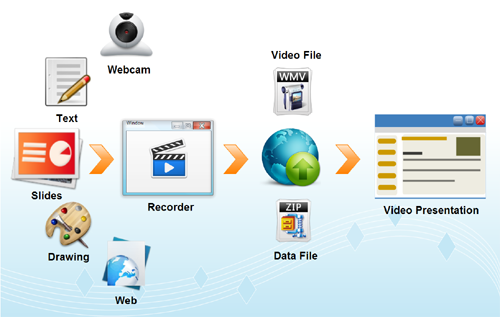 The recorder integrates a variety of presentation aids and synchronizes presenter's audio and video, PowerPoint slides, hand-written text, drawings, and Web content. PresentationTube presentations provide a scrollable slide thumbnail allowing the user to move to the respective video content and control both the time and progress of video presentation. A video presentation allows interactivity also via comments, allowing the audience to be heard and involved. PresentationTube video presentations are accessible via desktop and mobile devices, and can be used in regular classrooms, e-learning environments, conferences, and business orientations. PresentationTube is free and videos are hosted on high-speed media streaming servers to provide a rich experience with unlimited bandwidth and storage space.